For years, DC Comics' iconic male superheroes have had female sidekicks and love interests who have grown beyond those limiting roles, evolving into empowering characters with their very own comics. (I'm looking at you, Batgirl, Supergirl, and Catwoman, to name a few.) One of these characters, Aquaman's wife Mera, has never been given the proper spotlight, much less her own title. But that's all about to change, as we've learned (via Newsarama) that the Queen of Atlantis is finally getting her own series from DC Comics starting in February 2018. Mera: Queen of Atlantis will be a six-issue limited series written by Dan Abnett (Aquaman, Guardians of the Galaxy) with art by Lan Medina (Fables). It will be set in the same time frame as the current storyline running in the monthly Aquaman book. Right now in the pages of Aquaman, the kingdom of Atlantis is caught in a bloody civil war after King Arthur was removed from his position as monarch. Now Mera is a queen in exile, and she is doing her best to keep the peace between Atlantis and the surface world. Mera debuted over 50 years ago in the pages of Aquaman, and was a bit of an anomaly at the time. In the '60s, superheroes were never allowed to get hitched, and characters like Lois Lane and Catwoman were forever chasing down male heroes hoping they could get them to commit. Aquaman did marry Mera however, and she became and integral part of his adventures. The two even had a child together (who was later murdered, because the only thing comics hate more than superhero marriage is a superhero with kids). Mera isn't actually an Atlantean; she's from another dimension called Xebel, so she is a stranger is a strange land even in Atlantis, which she now rules. That makes her an even more fascinating character to explore. Her "hard water" powers are particularly cool, and maybe--dare I say--even cooler than Aquaman's. With actress Amber Heard playing Mera in both Justice League and next year's Aquaman movie, now seems to be the perfect time to give the character her own series. With any luck, it will be popular enough that she will get her own ongoing comic as a result, and not just a mini-series. "From the pages of Aquaman comes a brand-new adventure starring Mera, in her own title for the first time ever! As the brutal Atlantean Civil War rages, Mera must keep the peace between the surface world and Atlantis as its newly anointed queen in exile. But when Aquaman’s brother Orm, a.k.a. Ocean Master, learns of his homeland’s fate, he’ll stop at nothing to return to Atlantis as its king and savior!" 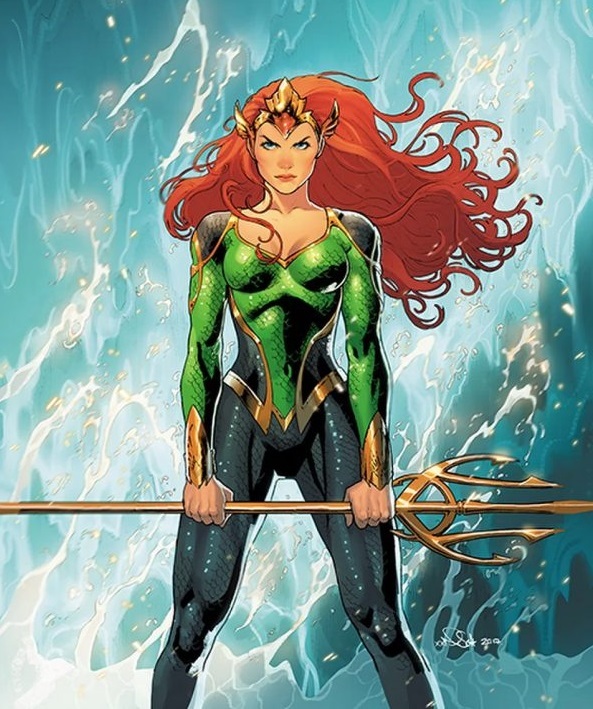 Are as excited as we are to see Queen Mera finally get her due? Be sure to let us know your thoughts down below in the comments. What else is happening in the DC Universe? Add superhero style to your wardrobe with these DC Comics jackets! What does Mera mean for the DC Extended Universe?